Jewish groups in Britain condemn uptick in racist harassment and other hate crimes following referendum. 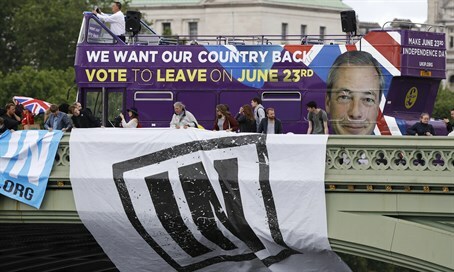 (JTA) -- Jewish groups in Britain condemned the uptick in racist harassment and other hate crimes in the wake of the country's vote to leave the European Union. There has been a 57 percent rise in reported hate crimes and racial incidents since the June 23 referendum, according to reports. The Community Security Trust, the security arm of the Jewish community in the United Kingdom, told JTA on Tuesday that it has not observed any increase in expressions of anti-Semitism in the wake of the vote. The Board of Deputies of British Jews in a statement issued earlier this week called on the government, civil society and businesses to make it "absolutely clear that EU nationals and other minorities resident in the United Kingdom are protected and valued." "It is important during these times of political uncertainty in our country to ensure that nobody feels vulnerable and threatened," said the statement from the board's chief executive, Gillian Merron. Merron added: "The Jewish community knows all too well these feelings of vulnerability and will not remain silent in the face of a reported rise in racially motivated harassment." The head of the London-based Jewish Leadership Council, an umbrella body of more than 30 Jewish communal organizations, said in a statement issued Tuesday that it "join(s) with fellow communal leaders and politicians in condemning the incidents of hate crime and intolerance following last week’s Referendum. As Jews, we have long had experience of hatred and discrimination and trust that all leaders will ensure that the outcome of the Referendum does not undermine the tolerance, diversity and inclusiveness of the society we live in." The council's chief executive, Simon Johnson, also said his group is following the reaction of the economic markets to the Brexit vote.